With Spain defeating Italy at the 2012 UEFA EuroCup, I feel it’s only fitting I interview a Football (soccer) Coach. While the better team won, it was clear that Italy looked fatigued and sluggish, and you can’t argue that Spain had an extra day of rest to prepare for the final game. So I asked about conditioning, testing and training. In this interview, we have Mladen Jovanovic, a physical preparation coach from Belgrade, Serbia, currently serving the position of head physical preparation coach at Hammarby soccer club from Stockholm, Sweden. He is also a representative for Tudor Bompa Institute for Serbia and Croatia. 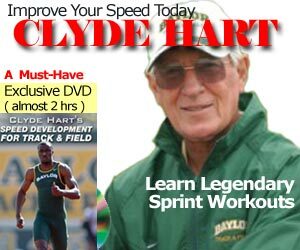 Q1 – SpeedEndurance.com: You have a speed and power background and many coaches in football clubs are labeled fitness coaches as they tend to be very specialized in conditioning and very little on speed and power. While the sport requires great conditioning could you get into the needs of power in football? Mladen Jovanovic: In my opinion most team sports are more similar in this regard than different – you need to have good vertical jump, good 5-10m acceleration, good speed (up to 40-60m, but that depends on the sport), good reactive strength, quick feet for quick repositioning and good, should I call it lateral explosive power. Compared to endurance qualities the power qualities are less trainable (which doesn’t mean we should neglect them, au contraire) and that might be one of the reasons why physical preparation coaches emphasize endurance – because effect of their work is easily seen by the naked eye, along with being less coaching and time demanding compared to power/speed training. Luckily, football (soccer) can be considered mixed sport (term I first heared from Lyle McDonald… see this link for more information) which mean that players doesn’t need to be extreme in neither speed/power nor endurance nor the training program in that regard. READ Can't Afford Dartfish? Try Kinovea. It's free! Q2 – SpeedEndurance.com: You do some conditioning tests and training methods that are less known, could you share what those are and why you came to your conclusions? In other words VO2max and aerobic performance are not the same. This is why I concentrate on aerobic performance. Test like MAS (5-6min or 1500-2000m time trial) and Martin Buchheit’s 30-15IFT gives me indicator where is the certain player with his aerobic performance (in the case of MAS) or his intermittent running ability (in terms of 30-15IFT) and allows me to individualize training more easily. Recent article by Dan Baker will provide great starting point for interested readers. Q3 – SpeedEndurance.com: Injuries are often part of the game but some are avoidable. Without living in paranoia how do you challenge the players but still keep things safe and sane? Mladen Jovanovic: I think there is no single feed-forward solution to this. Coaches still believe that injury prevention is simple introduction of corrective exercise(s) in the training program, but as always things are not so simple as we want them to be. Overall loading, recovery and playing/living stress needs to be taken into account, thus we need valid and reliable feed-back (monitoring) system for assessing training loads, fatigue levels and adaptations taking place. Without that we are just guessing and doing voodoo magic with the newest prehab exercises. At the moment we are trying to put a monitoring system to life and until that happens, players are challenged yet safe with using individualized workloads based on their testing results (like MAS test, squat, bench etc.). This is not perfect, but at least it is better than nothing. For evaluating practices we utilize Polar Team2 and this gives us some insight in training workloads as well. Q4 – SpeedEndurance.com: What do you do for screening? You have spent some time in the US and have been exposed to American conditioning coaches such as Mike Boyle and Vern Gambetta. Any thoughts on what you have taken from them that is similar and what you have taken that is different? Mladen Jovanovic: To be honest I have only basic knowledge regarding screening. That’s why we have Mikael Klotz in our coaching staff as our head physical therapist. Klotz is really great PT who is really into tracking data and using gadgets. He did some basic screening with the players to establish the baselines, so when the players are recovering from the injury he has a basic idea where they were before and how much they need to improve before joining the normal training. My opinion regarding screening would be that we need to identify KPIs in this particular case as well and track them using reliable and valid tests. When I was with Mike Boyle, they didn’t do any particular screening of the general athletes over there, but they did FMS on some personal clients or athletes with special needs. They also have John Palloff there to assist with this kind of problems. To me FMS might be a decent start, but I not sure how valid it is actually. I had score of 19 if I remember correctly and I had and still have hypermobility syndrome. I think FMS might be decent start, but without more precise assessment tools I think it is just worthless. One test I like to keep track off is modified Thomas test where you get actual angles and you have research to back it up that shows correlation with hamstring injury. Again, this revolves around the same problem as with the previous question. There is no magic bullet. Q5 – SpeedEndurance.com: You are doing a lot with data analysis, any suggestions you can share with coaches working in team settings with monitoring a diverse group of athletes with the needs of practice and travel? It seems that data is talked about but few are doing it consistently. Mladen Jovanovic: Get someone else to do it! Joking a side, the key is to track pragmatic data that you are actually going to use and that is easily tracked. I tend to split the monitoring into the three different groups – (1) analysis of acute workloads (using objective data, like GPS, physiological like HR analysis and psychological like sRPE), (2) fatigue and readiness to train (using tests like vertical jump to assess NMF, HRV and subjective reports among many others) and (3) long term adaptations (like 5-10m acceleration, 30-40m speed, VJ, MAS, 505 Agility, squat, bench press, etc.). I am by no means expert in this and I am just trying to bring this kind of system to life as well as learning statistics and data visualization. Vollaard, N. B., Constantin-Teodosiu, D., Fredriksson, K., Rooyackers, O., Jansson, E., Greenhaff, P. L., Timmons, J. A., and Sundberg, C. J. (2009). Systematic analysis of adaptations in aerobic capacity and submaximal energy metabolism provides a unique insight into determinants of human aerobic performance. J. Appl. Physiol. 106, 1479–1486.